My henna paste is a blend of natural, organic henna powder, cardamom and lavender essential oil, sugar, and distilled water. The oils not only smells wonderful, but it also helps to darken the stain. 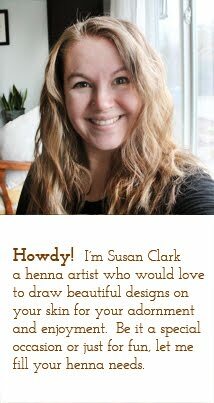 I use all natural, organic henna powder sourced from Sarahenna and essential oils sourced locally from Cowlitz Falls Lavender Farm and from Hennaguru. Each batch is mixed fresh with care for consistency, and texture. This is not black henna made with horrible PPD or tar that can do serious damage to your skin. Please never use black henna or any henna that claims to leave a dark stain in only 20 minutes. Please know that there is a difference from the reddish/brown stain that the henna plant will leave and the dark black of "black henna" which is commercially produced filled with additives and preservatives. Henna is a plant, Lawsonia inermis, and as such will lose its staining power after five days at room temperature. You will get to relax while watching beautiful designs being drawn on your skin; smelling the scent of fresh henna infused with oils. You will be participating in an art used since the Queens Hatshepsu and Cleopatra of Egypt; an art that transcends religion - written about in the Jewish and Christian Song of Songs, Islamic Hadiths and Hindu Vedas. Henna has been used for beautification, celebrations, religious ceremonies and weddings for thousands of years across Africa, the Middle East, Asia, and more recently in the United States. I offer freehand images and patterns draped across your hands, feet and body. Sizes range from little (finger decorations) to large (mandalas on your upper back). Prices vary according to size and range from $2 - $45. Or purchase a cone or five of premade paste for a DIY night. Cones are $7 each, contact via email or phone and allow 3 days for mixing & testing paste. B. $30 Two hands, back of hands and simple fingers. For a personal henna appointment or henna party with friends please contact me (Susan) at: sunohenna@outlook.com or call/text 360 304 0839. I will travel 20mi of Chehalis, WA free of charge.